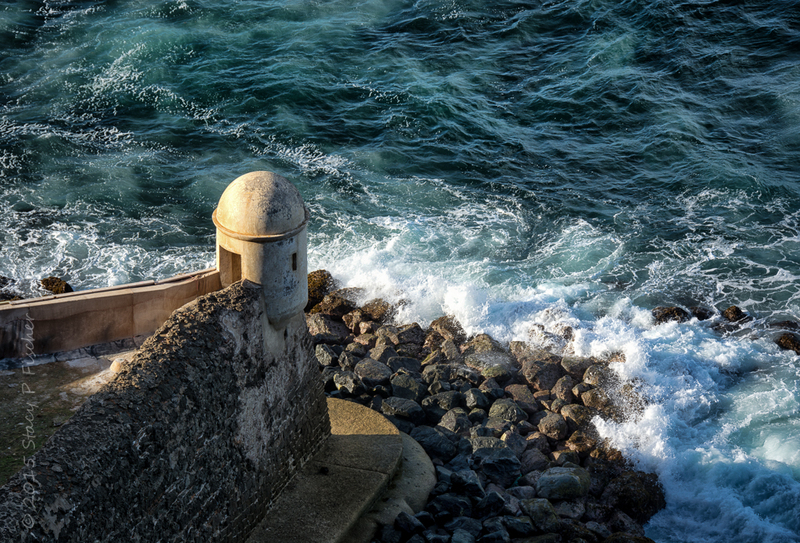 Legend surrounds this guerite on San Juan’s fortified wall, overlooking the Atlantic Ocean. Called “the Devil’s Guerite” (“La Garita del Diablo”), it is one of the oldest parts of Fort San Cristóbal, built in 1634. Some say soldiers randomly disappeared from the guerite. But the more widely believed story is that the only soldier who disappeared actually left his post to escape with his girlfriend. This photo was composed according to the rule of thirds. This entry was posted in Caribbean, Landscapes, Photo Challenges and tagged photography, postaday, rule of thirds, San Juan, weekly photo challenge. Bookmark the permalink. I´m loving your photos! Keep the good work. Layna, thanks so much for your kind comment and for your follow! I appreciate both more than you know. You can really see how powerful the ocean is in this shot. Thanks so much, Ben! Love the power of the ocean (and a bit of clarity didn’t hurt!). I love the different textures – the rocks and the waves ! I love the colors and the vivid cast of the ocean waves. Great image. Thanks, Raewyn 😀 It was a beautiful place! Beautiful image, Stacy. I love the placement of the tower and the sun shining off the waves. Great use of thirds! That is just gorgeous! I love how you took it from above too. There’s certainly not too much ocean in there. It fits this week’s theme nicely.